After wrapping up a visit with our relatives in Dekalb, IL we head back to Dubuque. This should include a quick trip over to Galena with my Mother in Law, Karlyn. Then…… wait for it…… we are coming up to the Twin Cities to complete the sale of our townhouse. I haven’t talked much about it because I just didn’t want anything to go wrong. But the day has come. Post of the Week: A huge congrats to our buddies and shipmates over at Adventures From the Road for being featured on WordPress Freshly Pressed this week!!! 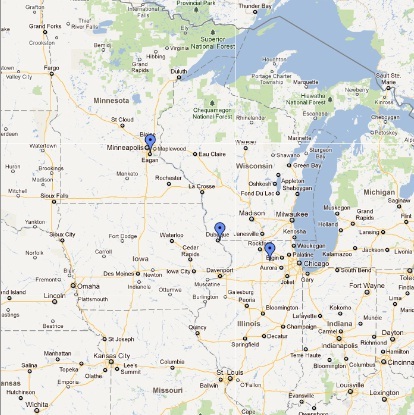 This entry was posted in Coming this Week, Life on the Road, Travel Life and tagged Dekalb IL, Dubuque IA, Eagan, MN, Twin Cities. Bookmark the permalink. Hope everything goes well for the sale. Congrats on the sale of your place, that is great news!! We are so glad that we got to see you and Pippi. She is such a sweetie!! If you need a groomer while close by, I have a good one LOL CONGRATS on the sale of the townhouse!! Congrats on selling the house! I’m sure it’s a big relief to you guys. And, I can’t believe that we missed each other again – I was in Galena a couple weeks ago for a family wedding. One of these days we’re going to cross paths. That is crazy!!!!!! Do you have family here? Congrats on your sale. That’s a big deal these days!